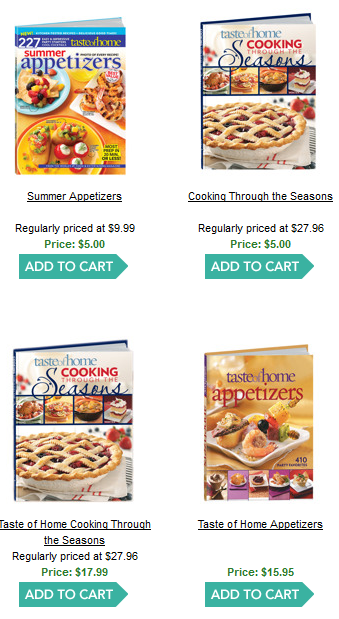 Great Deal on Hardcover Cookbooks! $6 Each Delivered! Go here and click "Shop Now" to get to Taste of Home's website and earn 7% cash back. Then, shop their cookbooks to find a ton of books priced at just $5 each! As you can see from the other books in the picture, this is a great deal! These are nice, hardcover books and some have a regular price of over $25! These would make great gifts to have around for the holidays so you're ready for "Secret Santa" or "White Elephant" gift giving occasions! Use coupon code LST63 to get each book shipped for just $1 or code LST88 for free shipping when you spend $20! Plus, today only, you can get a bonus $2.50 back into your ShopAtHome account for buying Elmo's ABC Book. That means you can pick it up for $3.50 shipped!